I made this dip yet again, but it was a major fail! I’m adding another tip to help prevent this from happening to you. See the updated post below for the oh so important information! If you’re anything like me you’ve been perusing Pinterest all week looking for the perfect menu for your New Year’s Eve celebration this weekend. Typically this is just Velveeta and Rotel thrown together in a big Corningware bowl and zapped in the microwave until it’s nice and melty. This year though I really, really wanted to do something different. 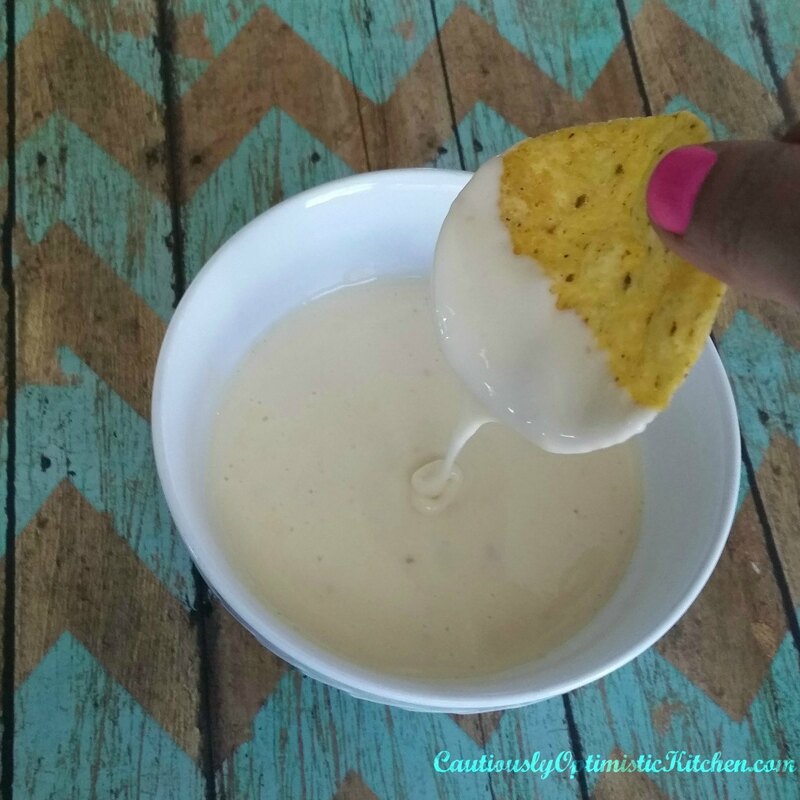 I have tried for years to get that silky, smooth, cheesy liquid gold White Queso just like the local Mexican restaurant. 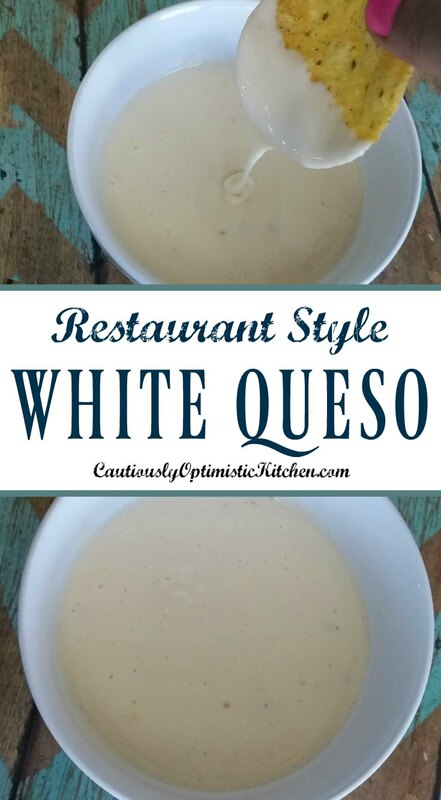 I tried several years ago to make a recipe I found online that called for a really expensive white Mexican cheese and a can of green chilies. But it just wasn’t quite right. It wasn’t rich enough. Or…. cheesy enough? I’m not sure I can explain it, but it just wasn’t the one. So I continued searching. And the search is over! 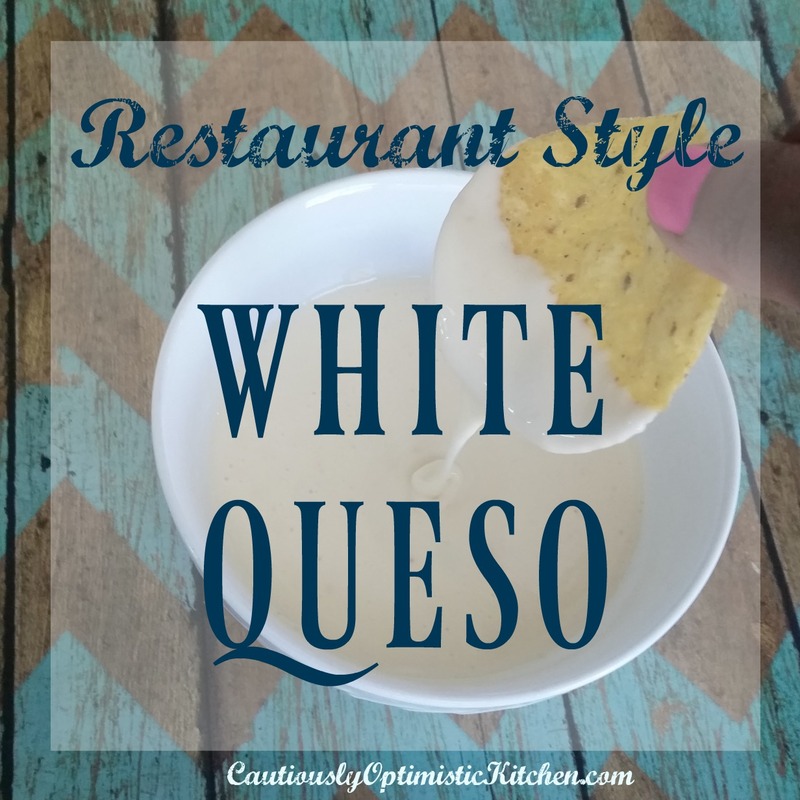 This is THE recipe for White Queso. It is so, so easy you just might cry. Seriously. It is so easy and so simple I felt absolutely ridiculous it took me so long to discover it! 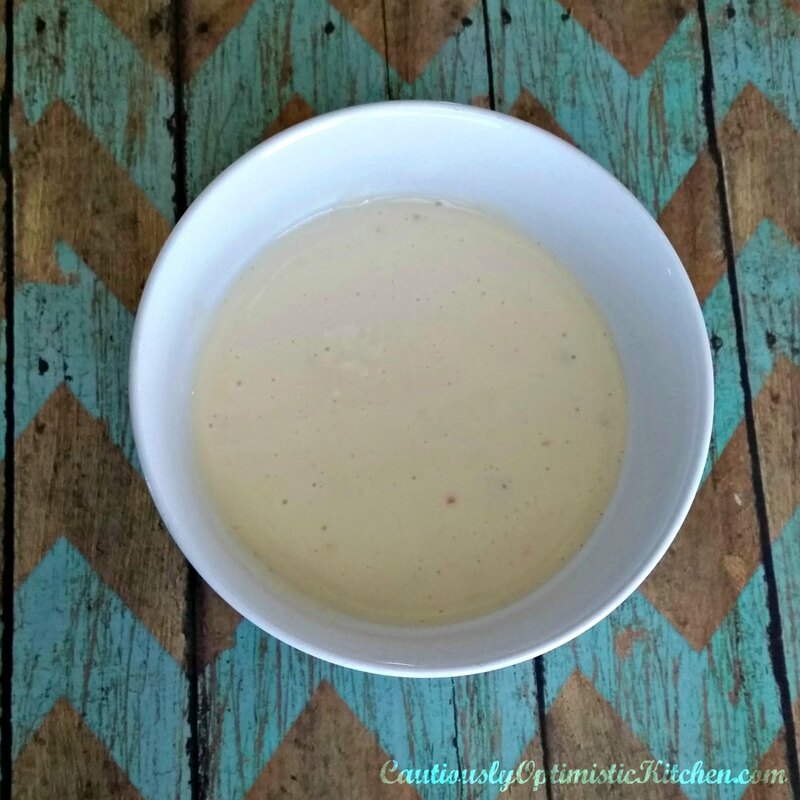 If you will follow this recipe without making any substitutions and the directions exactly, you WILL have great cheese dip that is just as good- if not better than the Mexican restaurant! There are a few tips you need to know about to get that super creamy, melty consistency. After my major fail of making my own recipe I wanted to update these tips. The first time I made this recipe I used a pepper jack cheese my husband picked up for me from the deli counter. I just had it cut in one big half pound block and shredded it before I used it. The second time I made this I used a block of cheese from the refrigerated cheese section. And oh was it ever a mistake! This is really disappointing for me because I am trying to give up processed foods as much as possible. But there just isn’t any way of making this dip work otherwise. Obviously I won’t be eating this on a regular basis so I’m not going to let it get me too down! Now I know though, if I want this to work correctly I will have to use a processed cheese. Don’t just throw a big ol’ hunk of cheese into your pan. Shred it before you begin. DO NOT— I repeat— DO NOT use pre-shredded cheese. Man up, and shred that block yourself! It’s totally worth the extra 60 seconds. Besides the fact it tastes so much better, it will also actually melt. The pre-shredded cheese has a powder on it that keeps it from sticking to itself in the bag and you guessed it- keeps it from melting properly! Second, use a double boiler system. I know you’re going to be tempted to zap this in the microwave. You’ll burn it and you’ll be mad at me for giving you a recipe that didn’t work. So just listen to me and use a double boiler. You may not have an actual double boiler, and that’s okay! You can make due! All you need are two pans or a pan and a large heatproof bowl (no plastic!). You will bring a pan of water to a light simmer and then set another pan (or bowl) on top of the pan of simmering water. Do not submerge the top pan in the water. I place a jelly jar lid in the bottom pan of simmering water, then use another pan that is slightly smaller and rest it on top of that to keep it just out of the water. Whew! Does that make sense at all??? Using a double boiler will help the cheese melt slowly and super smooth. It keeps it from melting too fast and from burning or getting chunky. That’s not it. If- and I mean IF- you have leftovers, add a bit of milk to the cheese before reheating. It will help it melt smoothly again! Now let’s do this! You are going to be so surprised how quick this comes together and how delish it is!! Add 1/4 cup of milk, butter, and cheese to pan. Stir constantly while cheese melts. Add more milk for desired consistency. If you'd like less spicy dip use slightly more mozzarella and less pepper jack. Now I’ve got my gears turning and I’m thinking of so many ways to use this dip! What about a Nacho cheese version for dipping your homemade Pretzel Dogs in? Or using it to make super rich Macaroni and Cheese?? Or what about topping your broccoli with it??? Let me know in the comments your favorite way to eat ooey gooey melty cheese!! Oh, and don’t forget to Pin it for later! !